Well this month, I have completed a couple of pieces that are off to join our other work from last year on the Inkberrow Design Centre stand at the West Country Quilt Show, Bristol. Nov 12 to 14th. Apparently they are looking forward to our two display stands as they will add extra interest in being a bit ‘different’! Our group this year is now starting to plan together as Out Of Line, an apt name in so many ways. No one is quite sure how next year will pan out, but we hope to exhibit some work together as we fledge from ExTextra. We’ve found that we have somehow grown a few feathers and it’s nearly time to take the plunge. 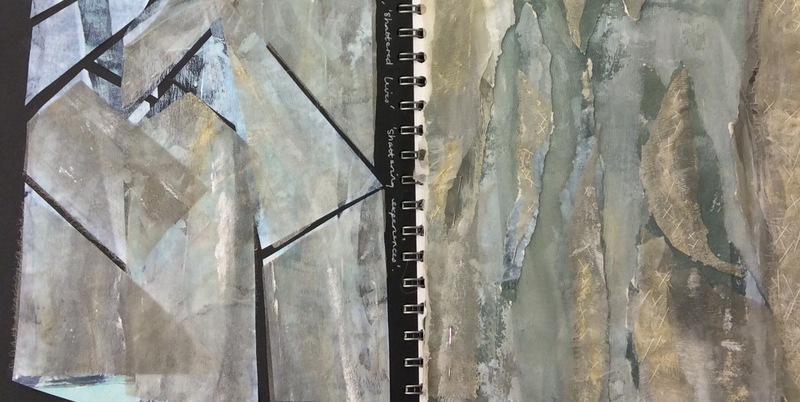 I have been thinking about what I felt was lacking in a recent piece I finished, and came to the conclusion that it was missing some sort of energy – it just felt a bit lifeless. It was a piece about about stone which is pretty static on reflection 😀. Seriously though, I didn’t plan it, I was just playing around with bits of dyed fabric from some Leaf litter and thought it might look good stitched. I cut some paper up to audition some pebble shapes on top but got a bit stuck after that. 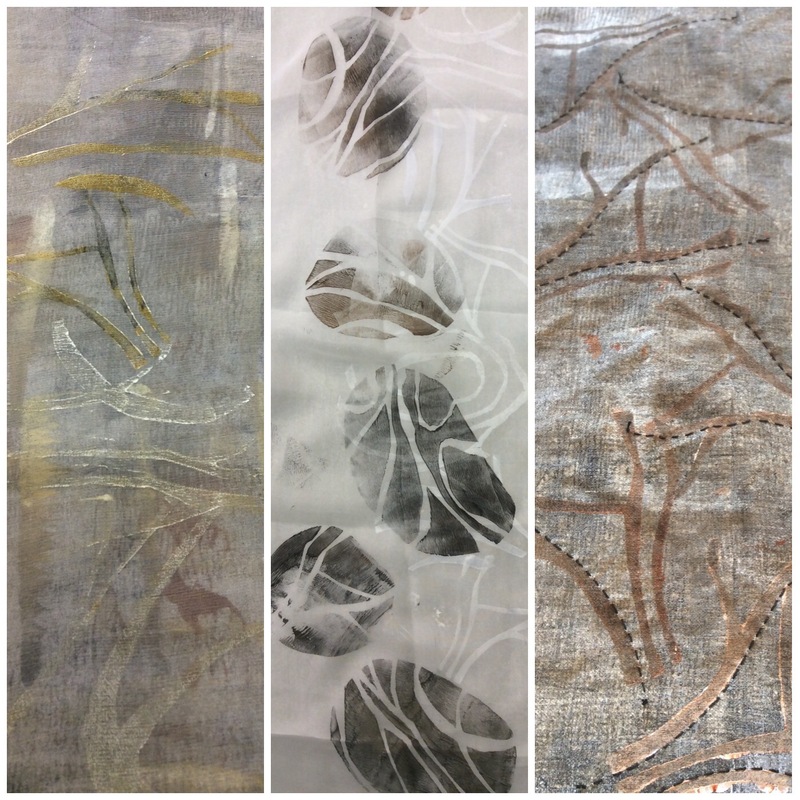 I have really loved playing in my sketchbook, and the discovery of paint on silk chiffon/organza as a texture for stone so I used that, but was far less pleased with the product than the process. It isn’t bad, it’s just missing something. We discussed the layout of the pebbles at ExTextra with mixed opinions. Was it a design thing, if I had done five so that they could be out of line or grouped more pleasingly might that have been better? Yes, I think so. I quite liked parts of it, but there was always something making me itch, if you know what I mean? Just about the same time, I read Helen Terry’s blog and she mentioned the need for ambiguity, and I took this to mean not representing a subject quite as obviously as I had done in this case. I thought ‘that’s the word, that’s what’s missing – something that feels more interesting to look at.’ I’ve long been drawn by art that suggests the human form rather that representing it more overtly. There may be a few reasons why, but I’m sure one of them is that it leaves a sense of mystery and allows the brain to wonder for a minute. 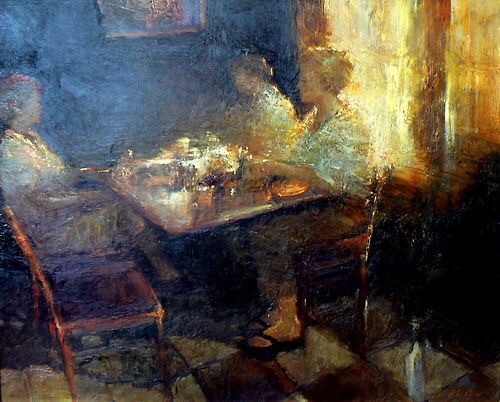 I love the work of Dan McCaw and how he paints people. They are painted in a way that hold your gaze. Incidentally, his use of colour and light is wonderful. It’s a complicated thing, because we all appreciate art that re-presents a subject to almost photographic precision as well as that which hides it good ‘n proper. 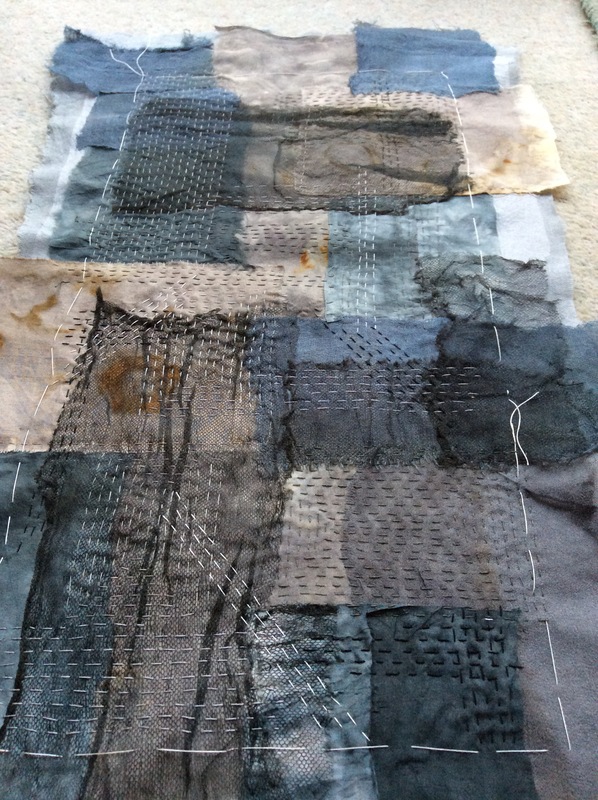 In the world of mixed media and textile art, ambiguity is not likely to be far away but we may not be conscious of employing it as an element of design. We just know when we haven’t. I’m still trying to approach things in a more relaxed manner and allowing ideas and learning to overwinter, but I have to say this idea of ambiguity has rather taken me. So I’ve just tried some quick prints at our last ExTextra weekend and am experimenting layering different parts of the print blocks onto sheer fabrics. These ones are messy so I think I need to tape down anything that moves and try some more. I’ve also started ruminating about shards, but that’s another story (I think there may be medicine for that sort of thing). I’m going to do some felting with a good friend in a few days and I can say with complete confidence that whatever I produce will definitely be ambiguous. Thank you. Ive changed the link, and also discovered your site. Look forward to seeing more. I so like your work but I think the patched and running stitched background maybe is what stopped you resolving your stones. I have a little rant on my blog about this slow stitching everyone is trying, There even is a book , Slow Stitching. Lovely book but this technique is not suitable for all textile pieces. 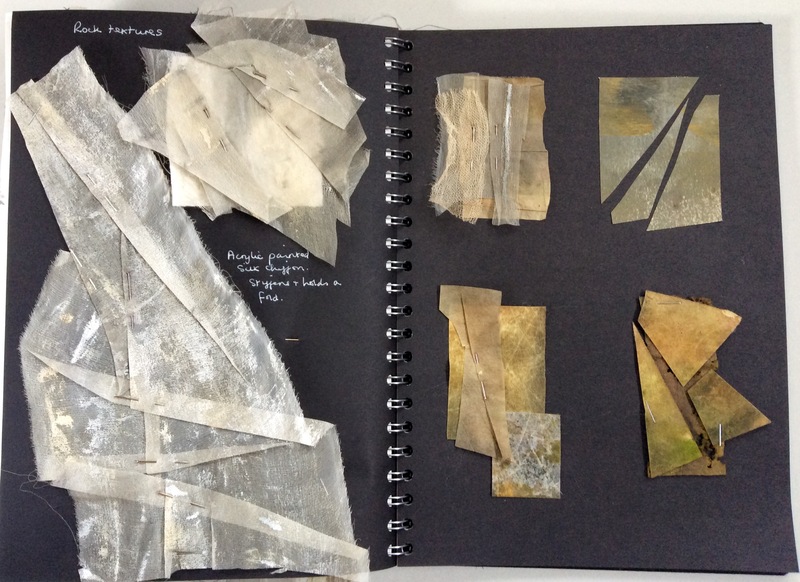 Your sketchbooks are lovely, the colours and backgrounds so your last pieces ,when you went back to your source, look very good and have a resolved feeling. Sorry if I have gone on a bit but this patched and straight stitching is taking over the world. Well not quite. Thank you. I do so love this on line community and no, I appreciate any comments. I think you might have something because once I stitched all over it, I didn’t really know what to do next. The straight lines conflict with the curves etc. I am seriously excited about trying again and freeing up. Great blog Rachael – always enjoy your posts & your work! The McCaw family certainly present some amazing work . 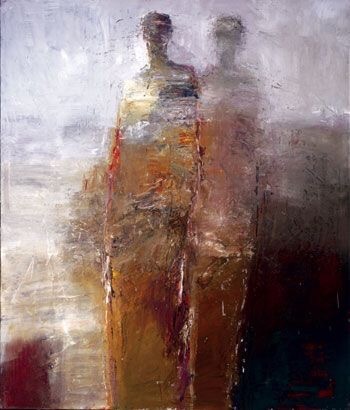 . . I’m really attracted to John McCaw’s pieces. And Rachael, there is no medicine so forget the hoovering (although I always ‘lux’ the floor) and go and play.